I appeared on Humble and Fred's show this morning, talking Blue Jays fever and spinning a few retro Jays songs. It was great fun chatting with the guys about the three songs they put together in the early 90s. Here's my segment. You can hear the entire episode of Humble and Fred here or on SiriusXM channel 168. It was a good chat with the lads… I hadn't heard the Sly Fox style one or the Freddy P original. I have the "Jays to the top" as I have a couple of those Charity discs. Humble did a great on job on both... he & Freddy P should do one for this year… put on their samurai man buns & do a video.. could go viral! How come your sound file sharings are never downloadable? Would love to have some of the ones missing from my collection.. & those Jay calling clips would be cool to have in my Blue Jay playlist. Let's Go All The Way… with The Jays To The Top! 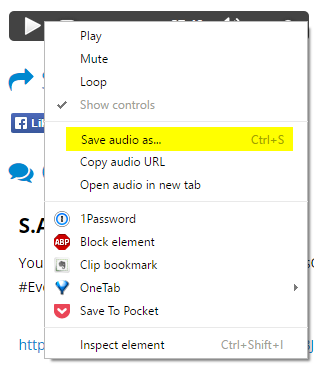 When I right-click on the audio player, I get an option to save the audio...in Chrome if it makes a difference. My player is now the standard HTML5 Audio player, which all modern browsers support. So do as @markosaar suggests and you can collect 'em all. Humble did Jays to the Top at CFNY. Not the Mix. I know because I sang on the chorus with Hal Harbour ( used to be the Indie Music expert at CFNY) Good fun. A half hour segment. A sure sign that these guys are on track for that big US syndication deal. Thanks Markossar & Mike for taking the time to share the info… got em! Thanks again Mike for being the master archiver that you are! Bets on if Anominous is Dumblell or more likely the spazz DJ from Peterbough that everyone laughed at behind his back before he was turfed by Fred.